As we leave Port Lincoln a shearwater moves beside us, appearing and then disappearing behind the swell’s smooth motion as it skates across the waves. Behind us dolphins shoot through the water, slipping out and around the bow, their pale bellies flashing as they veer and turn. The weather is high, and still; the early morning water like silk. Only as we round the cape does the wind hit, the swell thunking heavily into the hull so we pitch and roll, spray rising. To the west the low outline of the coast moves slowly past, the treeless hills and barren beaches strangely, powerfully familiar like so much I have seen in the last 24 hours. Although I’ve not lived in South Australia for the better part of 15 years it’s still there, inside of me: I realise thisas I stand watching it pass, those hills and the open sea evoking the same sense of loneliness and loss one can hear in the names the early explorers gave them: Dangerous Reef, Memory Cove, Cape Catastrophe. Coffin Bay. Our destination is to the south-east, a lonely series of rocky islets called Neptune Islands that sits scattered across the mouth of the Spencer Gulf. Save for the seals and the seabirdscongregating on their low shores they would harbour little of interest — a ruined lighthouse, the condemned remains of a scientific station — were it not for the fact that they are also one of the few places in the world where Great White Sharks are known to congregate. Having spent the last few weeks reading and thinking about these shadowy creatures I am now travelling to this place I last visited as a child, to see them for myself. Four hours later we arrive. Choosing a mooring in the lee of South Neptune baits are set and berley cast out into the water. Tommy ruffs rise to peck at the red cloud of messy fishmeat, glittering and quick, darting and turning while others nibble at the hunks of tuna carcass that trail behind the boat on baitropes. We stand watching as the crew lower a battered cage from the back of the boat into the water, the passengers laughing excitedly at the dents in the metal — evidence of previous encounters with the creatures we are here to see. ‘How long do you think we will have to wait?’ someone asks, but as they say this one of the baitropes goes taut with a crack and all 17 metres of the boat jerks sideways. With the others I run to the side, but the bait — the back third of a tuna that would have been a metre and a half long when it was alive — is already gone, the rope floating free. I struggle into my wetsuit, digesting instructions on how to enter and exit the cage without being tipped over the side by the swell or overbalanced by my weightbelt. And then I’m off the back, and into the water. Beneath the surface I grasp for my regulator. Although broken cloud moves overhead and the cage rises and falls in a metre or more of wave, the visibility is good, the water an impossible blue, deep and smoky. 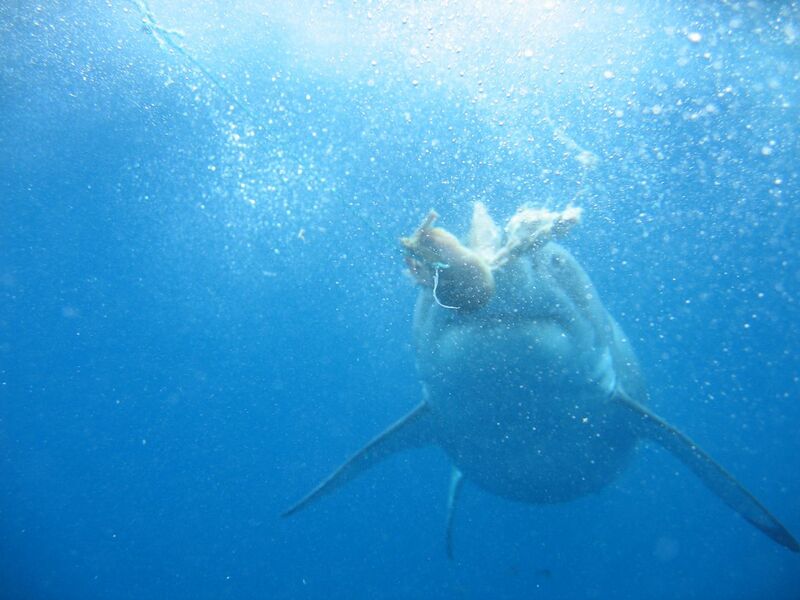 Immediately in front of the cage a tuna’s ruined neck and gills float, a billow of filmy guts beneath it. The water is cool, enclosing. For a long time nothing happens. And then, just when it seems that the creature must have gone, slipped away into the ocean, a shape appears out of the blue, swimming steadily towards us. In the perspectiveless colour of the water it is hard at first to tell how large it is; it moves casually, almost effortlessly, its body weightless, its eyes trained on us. Only as it gets closer does the size of it become apparent, the power. I had thought it would be more beautiful, I realise, sinuous, and sleek, like a tiger. But despite the sinister ease with which it slides through the water there is nothing beautiful about it. Rather it is brutish, possessed of the overdeveloped look of the tomcat — that massiveness, though applied to a frame more than five metres in length. 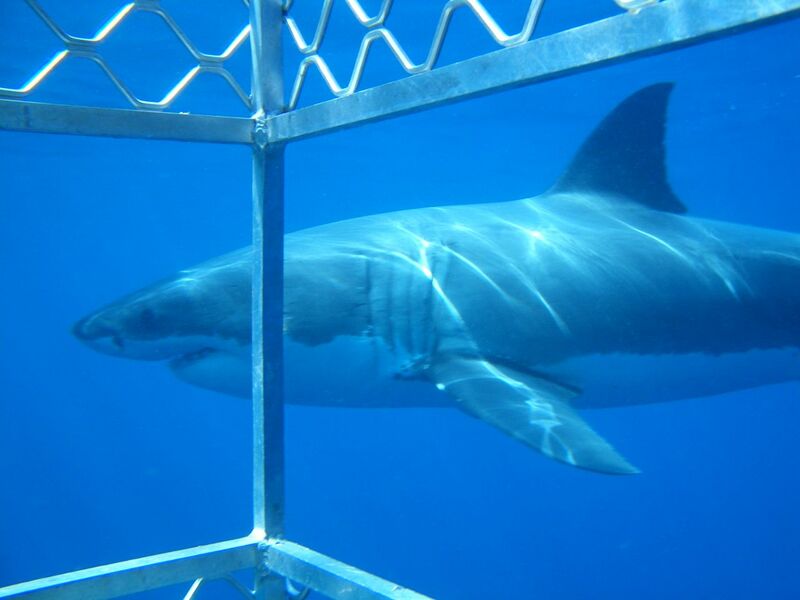 As it approaches we move closer to the bars of our cage, eager to see more. Its mouth — surprisingly small in its head — hangs open, the uneven teeth protruding raggedly, the nostrils visible above them as blunt depressions. Behind its pectoral fins swim a school of silvery baitfish, following its motion with quick, shimmery turns like a clutch of young. The effect is oddly tender. In a moment it will turn, striking at the cage with sudden ferocity, the force of the blow sending all three of us staggering to the floor and leaving teeth embedded in the metal of the tanks. But for now it simply turns, passing so close beside us that we could touch it. One gill is torn, scars crisscrossing the nose and face, the black eyes cold and depthless as it gazes through the cage at us. What will be most surprising to me, as I look back, is that I am not afraid, even as it circles and strikes. Perhaps it is simply the reassuring fact of the cage, but faced with their lazy power of their motion, their careless brutality, I am filled instead with a sense of wonder that such things might still exist. It is as if the fact of their movement through these waters, the ghostly way they have appeared and will later disappear into the ocean’s immensity, like some half-remembered dream suggesting not terror, but something buried deeper, something primal, and deeper than words. Yet this is a creature with which I have shared an uneasy proximity all of my life. Always, everywhere: when we are in the water the idea of the shark is there with us, a shadowy presence lurking just out of sight, like the monsters that once lurked just beyond our campfires, unseen, unstoppable, implacable. 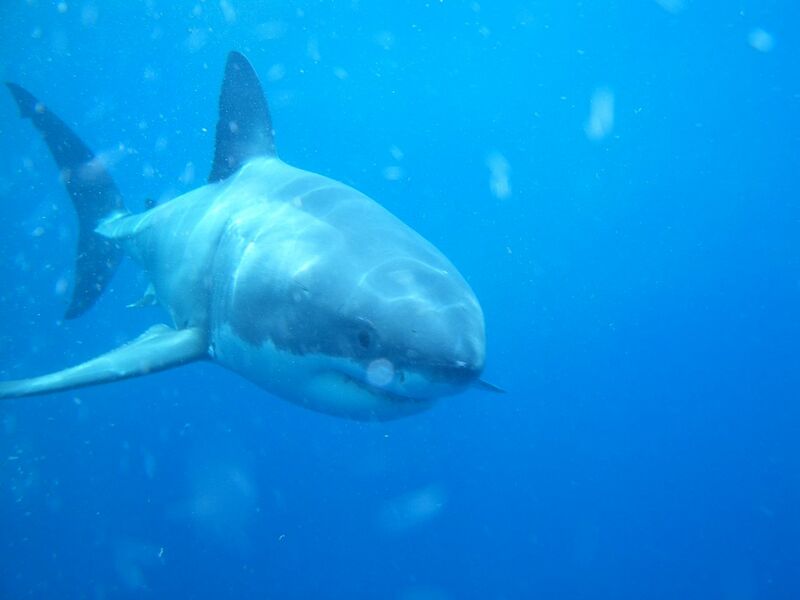 And of all the sharks it is this one – the Great White, Carcharodon carcharias – that we fear the most. 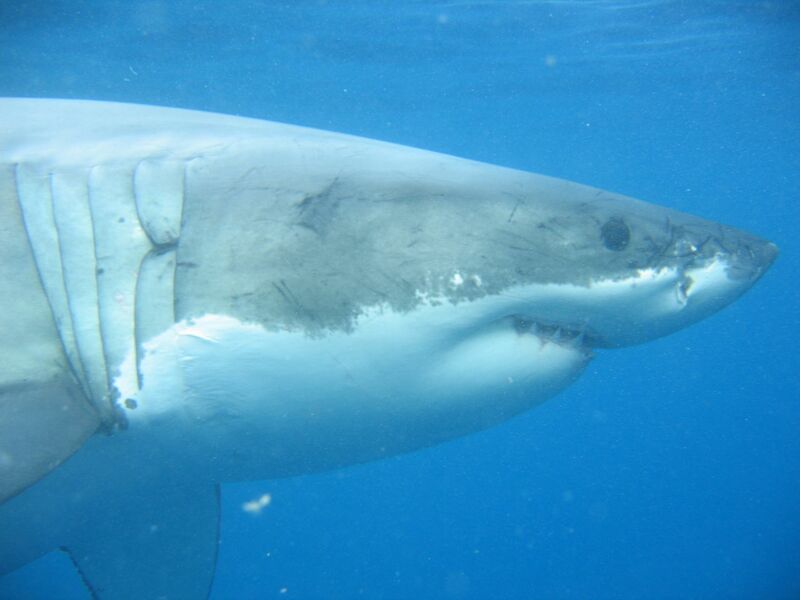 Seeing sharks up close, such fears seem natural enough. 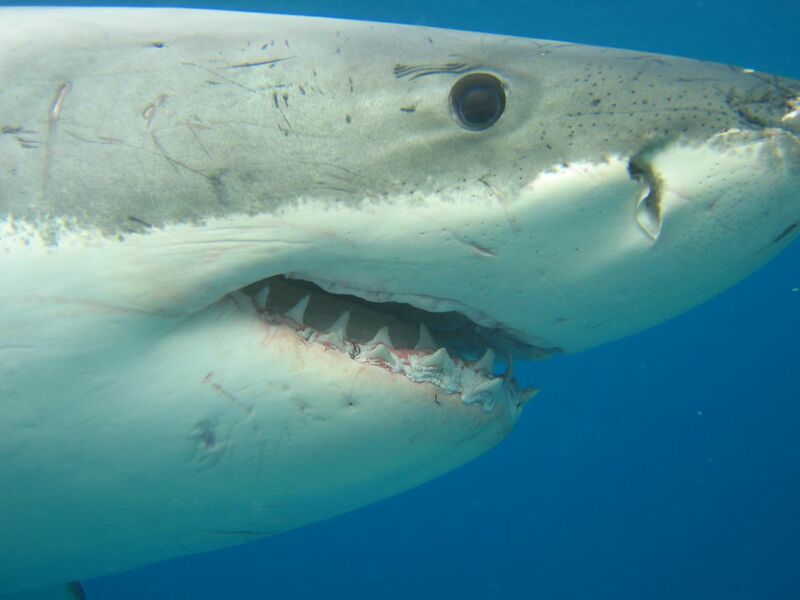 Sharks are sometimes caricatured as primitive, their basic design dating back some 400 million years, but in reality they are highly adapted and sophisticated creatures, their longevity testament to their perfection. Watching as they glide past or strike at the baits it is obvious that in some deep sense this is what they are for, that in their speed and savagery they are entirely and utterly themselves. Over the hours and days that follow, as I watch them gather around the boat, I find myself wondering at this quality in them. It’s easy to romanticise wild creatures, particularly ones as singular as sharks. Indeed in the case of a creature so feared, so maligned, romanticisation might almost be seen as a response to the horror they provoke in many. Watching them as they circle the cage, looking into their strangely empty eyes I find my own desire to see something ancient and unknowable reflected back at me, rendered somehow ridiculous by their obdurate alienness. And yet are the fears we project onto them any less ridiculous? As we drove through Port Lincoln, we had passed the Sorrento Motor Inn. Seeing it my brother reminded me that we stayed there once as children, 25 years ago, on a holiday with our parents. Looking out the window I realised he was right; I remembered not just the hotel but our parents’ warnings about the beach that runs behind it, curving away towards what is now the marina. People got eaten here, they told us over and over again, disappearing after diving off the back of fishing boats or dragged under while snorkelling off the rocks. My parents were not nervous people, but the threat posed by the sharks seemed real enough to them then, and real enough I suppose to us. On my second dive I take off my glove, peeling the nylon from my pale and wrinkled skin. 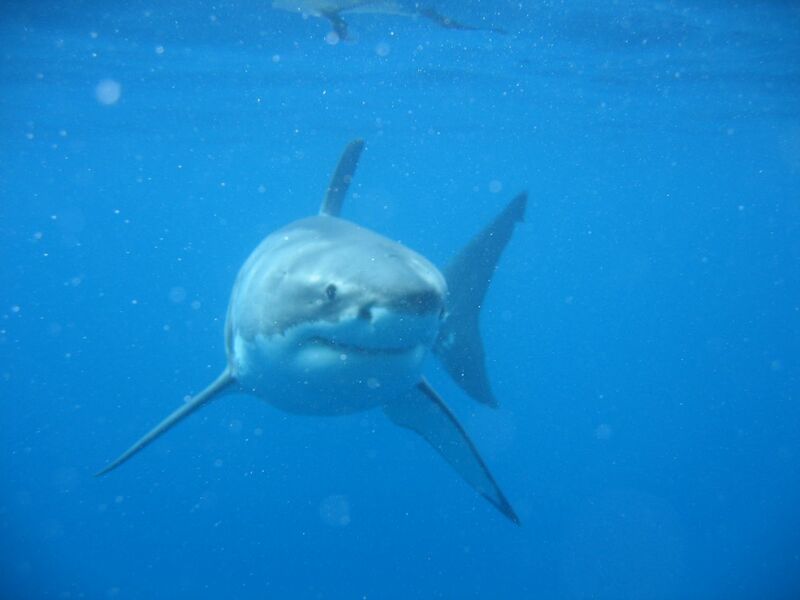 Though they live alone in the ocean, gathering only to feed or breed, there are four or five sharks now attracted by the smell of the bait and moving in long arcs around the boat, sometimes vanishing into the failing light for minutes at a time. Seen together they are surprisingly individual, their bodies and markings, even their faces, easy to tell apart. Some look tired, their mouths hanging open with apparent exhaustion; others are sinisterly clownish, their wide, bland faces cartoonish; others are sleek and savage, their bodies still slender. One by one they pass, watching the drifting baits. And for creatures with such a fearsome reputation they are surprisingly cautious, refusing to take a bait more often than not. 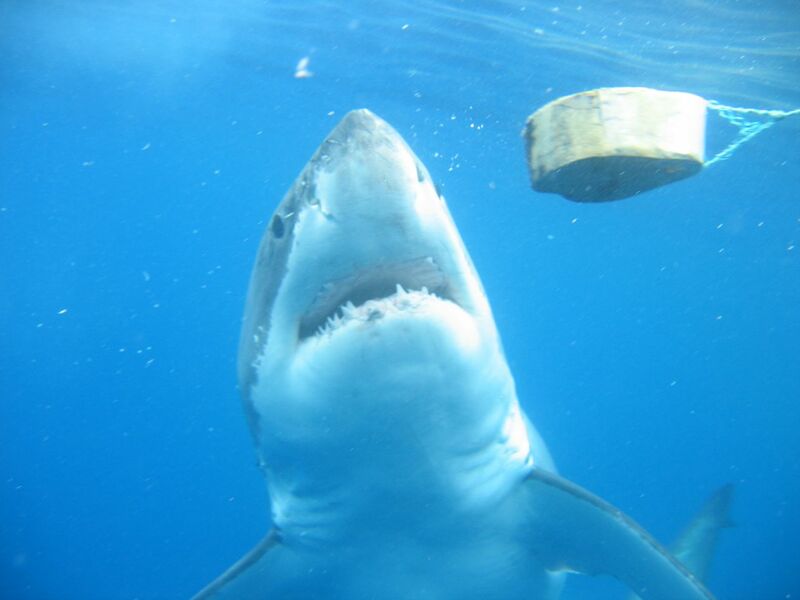 Biologists have argued this caution reflects the risk that their prey — adult Great Whites prey almost exclusively on large mammalian creatures such as seals — pose to them, rather than the other way round. Their characteristic mode of attack is designed not to maximise their chances of a successful kill but to minimise the chances of damage to their eyes from the teeth and claws of struggling seals, and so their lips peel back to push their jaws forward, and their eyes roll back into their head. Outside the cage I can see three of them circling, some way off. Flexing my hand I wait, watching them, and then, almost on cue, one — a five-metre male recognisable by the claspers behind his pelvic fins — turns inwards, heading towards me like a steadily moving torpedo. Despite the effortlessness of his motion he moves improbably quickly, his speed a reminder of the power of his body. Out on the perimeter of my vision I can still see the others, waiting, no doubt watching. As he draws closer he does not turn aside, and for an instant or two I have a very clear sense of being watched, considered. At first I think he means to ram the cage, maybe try and force his snout through the gap designed to allow easy filming. But then, at the last moment he turns aside, his body pressing against the metal so it creaks and grinds. Reaching out I grasp his pectoral fin, feeling for a moment the power in him before he pushes on. The mottled line where his darker back meets his paler belly passes close, and reaching out again I press my hand against it, not sure what to expect. 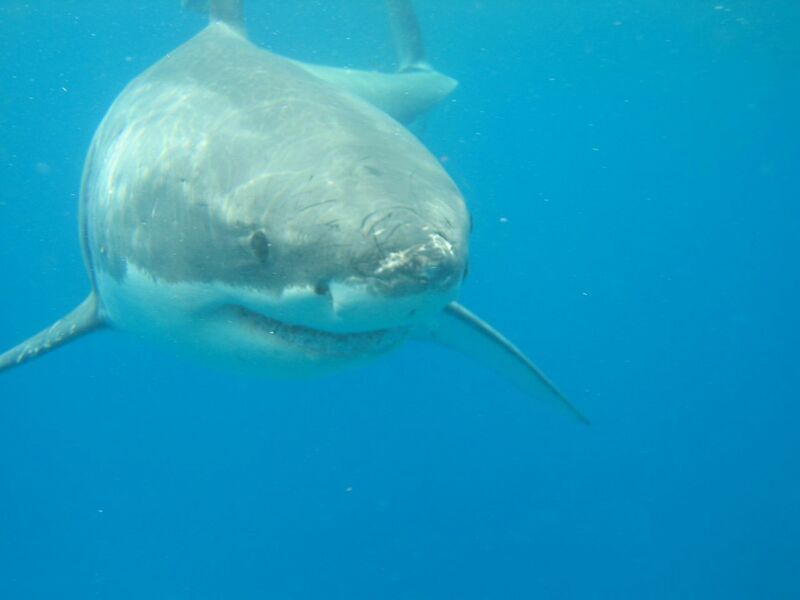 Great Whites, like makos and some large turtles, have warm blood: a heat exchange system in their bodies heats it to 24-27º, making their physiology closer in many ways to that of mammals and birds than that of other fish. That they can exchange energy more efficiently means their muscles can contract faster and more powerfully. As he moves by his skin slides under my hand, surprisingly smooth — the skin of sharks is made up of thousands of tiny dermal denticles, or skin teeth; rubbed against the grain these are abrasive, like sandpaper, but traced with it they can seem almost frictionless — and pressing harder I seek the warmth I know should be there. But whether or not it is my own skin gone numb in the cool water or the layers of insulating flesh between us, I feel nothing, only the skin itself, its resistance beneath my hand. And then he is gone, peeling away from the cage and away. I watch him go, swimming away as if my clumsy attempt to touch him has driven him to retreat: it’s strange how little is really known about these creatures, particularly given the space they occupy in our cultural imagination. 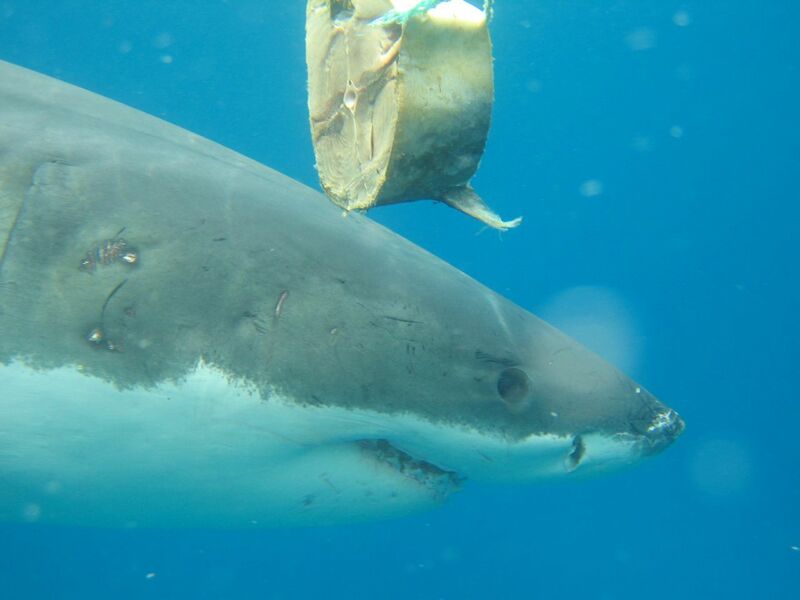 Studying marine animals of any sort poses considerable practical difficulties, and in the case of large, dangerous and migratory predators these problems are only exacerbated. It’s not even clear how many of them there are: some South Australians believe their numbers have increased since they were protected in 1997, but most other data points to an ongoing decline in their numbers, the recent spate of attacks along Australia’s coasts notwithstanding. There’s something peculiarly tragic in this. Of course the extinction of any species is a tragedy, but it’s difficult not to feel that we ourselves will be somehow diminished on the day the last Bengal tiger falls to a poacher’s bullet or the last polar bear is reduced to scavenging in rubbish dumps as the polar ice melts. In a similar vein the biologist David Quammen has recently argued for a reappraisal of the way we understand those few species which have regularly preyed upon human beings, seeking to tease out a more complex way of seeing them and, by extension, our place in the world. Drawing together narrative threads as diverse as Gligamesh, Beowulf and Alien, he suggests that our deep-seated fears of creatures such as the shark are not just predictable but actually necessary, even desired, serving to remind us of our limitations, our mortality. What’s interesting about Quammen’s argument is that it points out that those communities who live closest to these creatures — be they lions or bears or crocodiles — do not fear these creatures so much as respect them, even venerate them. Predator and prey are, if not quite two sides of the same coin, at least bound together by the nature of their relationship, the one made somehow more real by the other. By contrast societies such as ours, mercifully free of predators, feel the need to invent them, projecting our subliminal terrors and cultural anxieties onto cinema screens, and, presumably, beneath the waves. Like Alexander with the armies of the world vanquished, we find ourselves not ennobled by our success but diminished, and so we create monsters to make ourselves feel alive, as if knowing life depended on understanding how easily it might be snatched away. Near dusk on our third day, great clouds of shearwaters wheel overhead, dark against the paling sky as they gather for the night. At the back of the boat my brother and one of our fellow passengers are fishing, when one of them hooks something big. 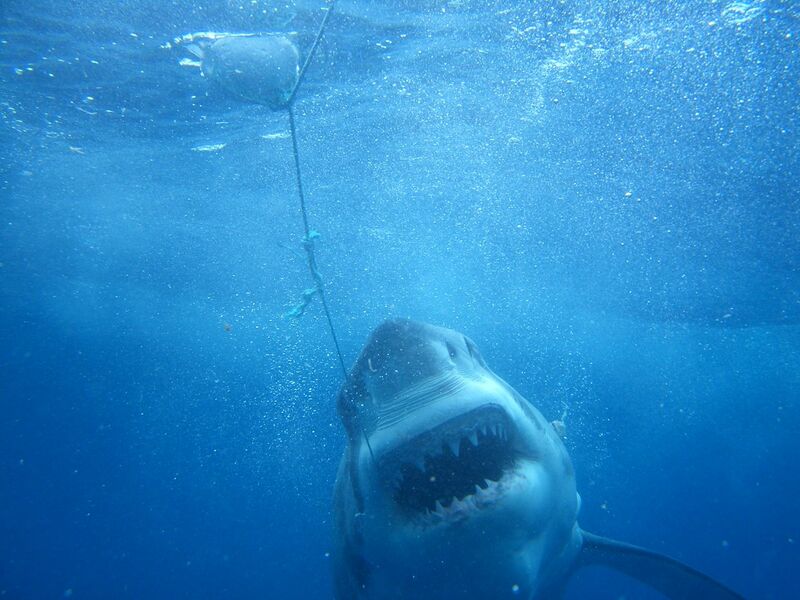 There is much laughter, speculation that the shark from earlier — a massive five-metre male with a nose scored clean and pale by some unknown collision — might be on the end. Earlier today he’d struck at one of the baits, rolling up between the boat and the cage, sending the berley bucket tumbling into the water and smashing the occupants of the cage back in a great kicking surge before biting clean through the massive rope which secures the cage to the boat. And though we all of us know it is not that shark’s weight against the rod — that the line would have snapped — we gather, curious to see what has been caught. Almost on cue, as they strain to bring whatever it is that has been caught on board, he appears, gliding beneath the boat, the white spot on his snout clearly visible in the dark water. We all shout, excited, and as we do a huge grouper, almost a metre and a half in length, comes looming into view, fighting on the line. 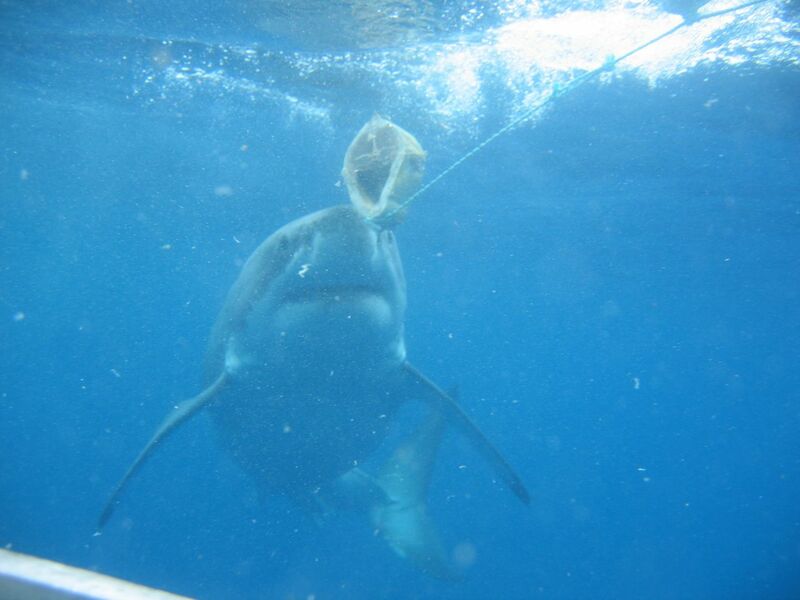 A few metres from the boat the shark turns, swinging back as we haul the grouper higher, trying to save it. As it thrashes on the line the captain leans over, only inches from the water, trying to draw the hook from its mouth. The shark passes underneath again, and as it does the grouper floats free, flapping half-submerged, its swim bladder swollen from the too-quick ascent to the surface. It flounders away from the boat, struggling to dive, and we laugh and shout, urging it to swim while in one long, almost lazy roll the shark surfaces, its huge head rising from the water to engulf the fish in its maw. It rolls once and then again, its body flashing dark and dazzling white as it turns. 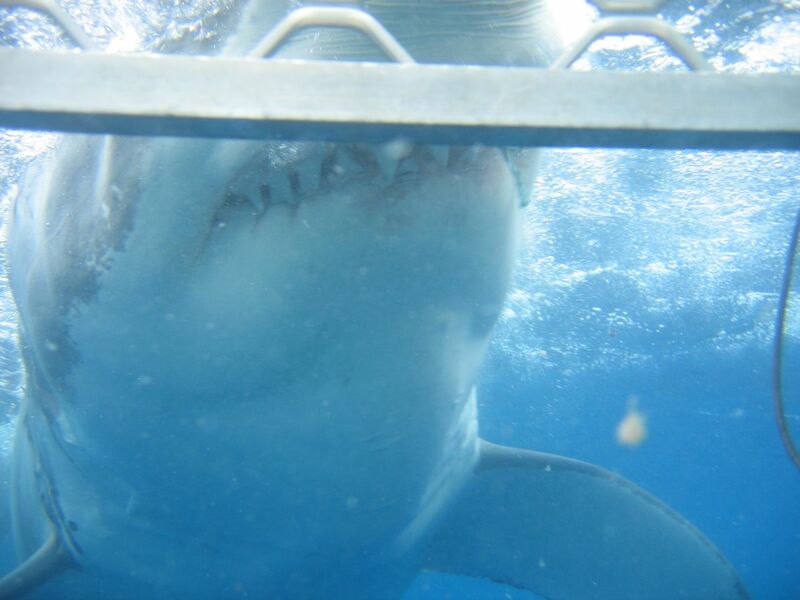 Though this afternoon I stood so close to it I could touch it without fear the effect now is terrifying, the sheer size of the shark, its power suddenly brought home to me — to all of us — as much by the casual economy of its attack as by anything. 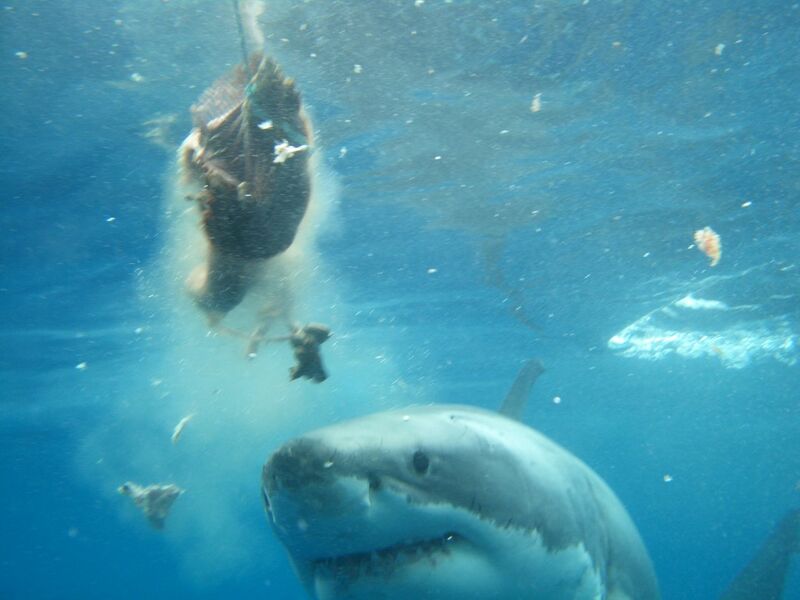 For a few seconds the shark turns near the surface, flicking its tail and slicing around, still caught up in the attack. On the boat all of us are whooping and shouting, horrified by the spectacle and excited by it, demanding of each other, did we see it? 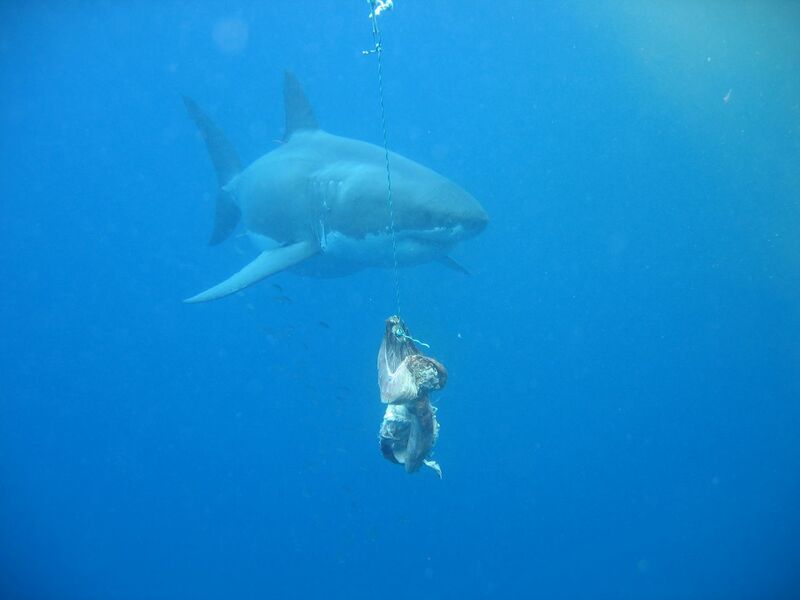 And then a few seconds later the shark erupts from the water again, caught in a craypot’s ropes, struggling in the buoys, turning and fighting, before pulling the buoys down with it and vanishing. For a long time we stand staring after it, wanting it to return. I’m sure I should feel sorry for the grouper but I don’t or not very. Indeed I almost wish one of the seals I can hear crying on the rocks a few hundred metres away might swim close so I could see it get taken too. I know — all of us know — that we have seen something here modern humans rarely get the chance to see, some vision of the primal, horrible and magnificent. And in its wake I feel enlivened somehow, as if my awe has reminded me of some part of me I had forgotten, the feeling lasting until long after the shark has gone, so long that later that night, in the silence of our cabin my brother and I find ourselves laughing at it, elated, still buoyed by the violence of the shark’s attack, the memory wild in us.